Super Bowl Will Be A Family Affair: Harbaugh Brothers' Ravens, 49ers To Clash : The Two-Way Baltimore, coached by John Harbaugh, will play Jim Harbaugh's San Francisco team in Super Bowl XLVII on Feb. 3. Teams coached by brothers have never before met in the NFL's championship. 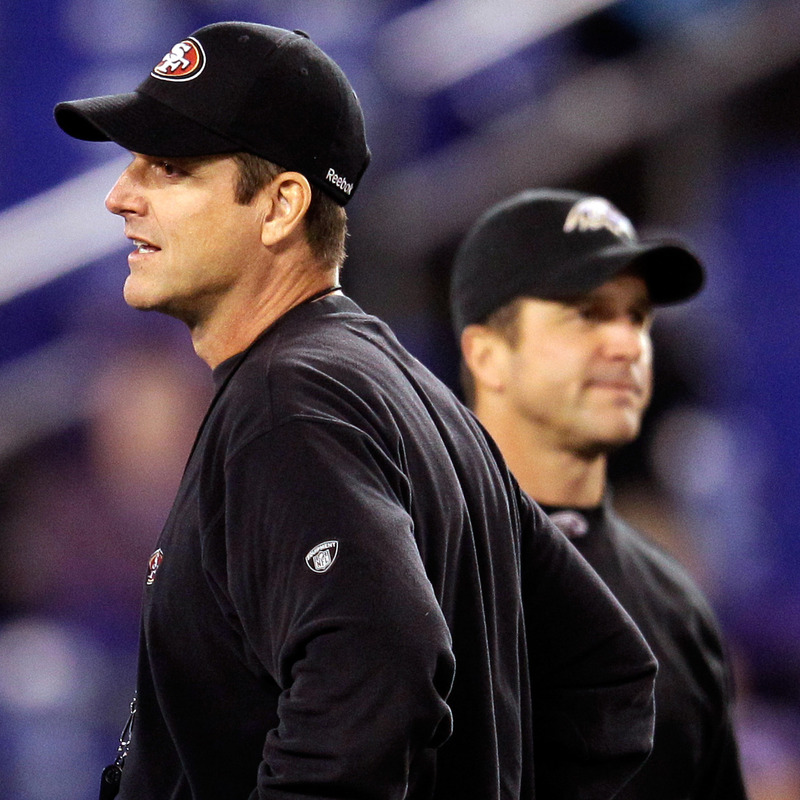 Head coach Jim Harbaugh (left) of the San Francisco 49ers and his brother, head coach John Harbaugh of the Baltimore Ravens, before a game on Thanksgiving Day 2011. Their teams will meet again in the Super Bowl. Super Bowl XLVII will be a never-before matchup of teams coached by two brothers. The Baltimore Ravens, led by John Harbaugh, will play his younger brother Jim's San Francisco 49ers on Feb. 3 in New Orleans. Maybe it should be called the Harbowl, as they're saying on NFL.com. The Ravens are going to the big game thanks to an upset 28-13 win over the New England Patriots Sunday evening in Foxboro, Mass. Earlier in the day, the visiting 49ers beat the Atlanta Falcons, 28-24. ESPN's "quick takes" on the upcoming game start with the "historic family reunion" and end with how the Super Bowl is expected to be the "last dance" for Ravens' linebacker Ray Lewis. The Harboys' ... make that Harbaughs' ... teams have met once before. The Ravens beat the 49ers 16-6 on Thanksgiving Day 2011.